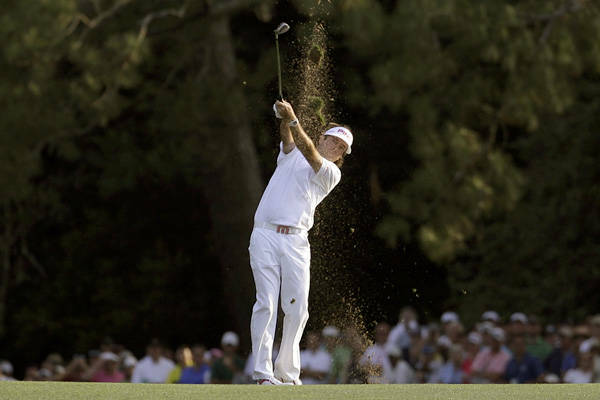 With Bubba Watson’s exciting playoff victory over Louis Oosthuizen at the 2012 Masters still amazing golf fans everywhere, it is notable that there was at least some benefit derived from I.K. Kim’s devastating missed opportunity at last week’s LPGA Kraft Nabisco Championship. Kim missed a one-foot putt for par that would have cinched the title. Shellshocked, she went on to lose the playoff to Sun Young Yoo. I.K. Kim at the LPGA Kraft Nabisco Championship. Watson commented that he had often dreamed of a putt to win the Masters – the dream of almost every golfer in the world – but “I just never made the putt”. He had that opportunity during regulation play but just as it was in his imagination, missed his birdie putt on 18. No matter. Bubba’s imagination also helped him to craft the get-down screaming gap-wedge hook that set him up for the win…..a scenario and shot that no one could possibly practice. Because Bubba has no swing coach or other entourage of gurus so common to the tour players and tour wannabe’s these days, it should be interesting to see how all of the golf instructors and mental coaches will dissect ‘Bubba Golf’ during the coming season. Bubba is a natural player, unencumbered by nothing other than his own admitted array of thoughts and images of the game rummaging around in his brain at any given moment. Seems reminiscent of another tall, dashing, dark-haired gentleman who threw caution to the wind, played by the seat of his pants, got into trouble only to remarkably get out time after time – until, sadly, Seve Ballesteros’ time ran out last year on May 8, exactly eleven months to the day of Bubba’s Masters victory. Seve eventually did seek out swing help, which also appeared to be his undoing. Bubba is in line to pick up where the Spaniard left off and continue to dazzle the golf world with Seve-like inventiveness. Surely the game, and golfers everywhere, need this shining example.